The world’s top leaders, including Georgian Prime Minister Giorgi Kvirikashvili are now in Davos, Switzerland to participate in the World Economic Forum and shape global, regional and industry agendas for 2017. The forty-seventh annual meeting of the World Economic Forum will be held between January 17- 20 under the slogan ‘Responsive and Responsible Leadership’. One of the biggest themes at this year’s event concerns how the political and infrastructure investments into a modern Silk Road are affecting economic growth and interconnectedness across Asia and Europe. Top officials discussed this issue today at the session ‘The Silk Road Effect’, where PM Kvirikashvili delivered a speech to session participants. The Georgian PM believes further economic integration among Silk Road countries, as well as with other world economies, is essential for increasing the contribution of those countries to the global economy. PM Kvirikashvili emphasised the importance of Georgia's engagement in the ‘One Belt-One Road’ project initiative of the President of China. It is a network of different alternatives, and each of them is important for the growth of a healthy economy in Eurasia. This is about competition and cooperation at the same time. It is more about cooperation, however. 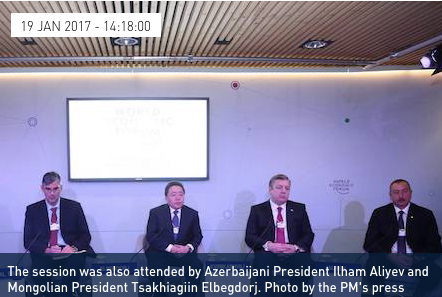 As mentioned by President [of Azerbaijan Ilham] Aliyev, the Silk Road brings with it enormous opportunities, but there are certain prerequisites in order to get the most of it in order to leverage on existing potential,” said Kvirikashvili. First of all is, of course, infrastructure. Second is stability across countries. This is about cooperation, cross-border procedures, and the unification of tariff systems. Of course, this is about political cooperation and has multifold dimensions”, he added. Kvirikashvili said Georgia has already signed cooperation agreements with its partner states. "The Baku-Tbilisi-Kars railroad project is nearing completion, being an important segment of the Silk Road going through Georgia to Azerbaijan and Turkey. Meanwhile, we are launching the construction of one of the largest ports on the Black Sea, which is the Anaklia Deeo Sea Port. We already have a winning consortium, a Georgian-American consortium, and they are looking for port operators in the region”, said Kvirikashvili. "We are modernising our railway and increasing its speed. We are investing much in road infrastructure. Of course, we are cooperating with other countries across the Silk Road. We already signed a cooperation agreement with China. We have completed free trade negotiations with China, and we will sign the free trade agreement in the nearest future”, he added. "In a nutshell, the Silk Road is about borderless cooperation. It is very important to mention that this economy is not only about transportation. This is about manufacturing cooperation and logistics”, the PM stated.